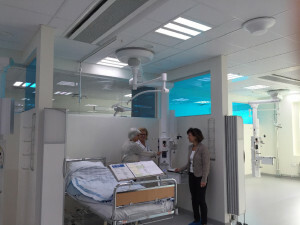 Centralsjukhuset in Karlstad uses health-promoting lighting solutions to support good patient care and improve the working environment. In April 2016, Centralsjukhuset in Karlstad will be ready with a state-of-the-art and future-proof operating house of 7800 m2. With this construction, the region Värmland is at the forefront with the latest technologies and a clear vision. ”It is to be the operating house of the future – with the patient as the centre of attention. We are creating the setting for a new patient flow, where the patient only has to go to one place. Furthermore, we are focused on a good working environment and flexibility. Here, lighting plays an important part”, says Tobias Kjellberg, Healthcare Manager. Besides Chroma Zenit Circadian Lighting at alle operation rooms, the new operating house will have Chroma Zenit Circadian Lighting from Chromaviso in 18 recovery locations, five supervision rooms and 9 intensive care rooms. It is a health-promoting lighting solution that supports the natural circadian rhythm of patients and staff. 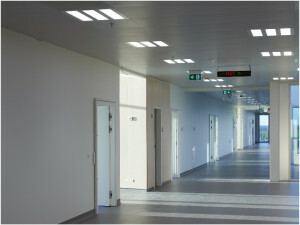 The combination of the two lighting concepts provides complete lighting. ”We know that patients recover faster with Circadian Lighting. We believe that the light has a significant effect – including on the staff. Therefore, we have chosen to give it priority”, says Tobias Kjellberg. The lighting solution is the subject of international research projects, where the effect of the light on patients and staff is measured with regard to sleep, well-being, period of hospitalisation, sickness absence etc. ”The light is brightest in the middle of the day in order to simulate daylight and to achieve achieve a physiological effect. 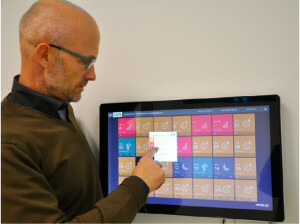 At night, a specially developed night light is turned on, ensuring that the staff has optimal lighting while not disturbing the circadian rhythm of the body”, says the innovation manager at Chromaviso, Torben Skov Hansen. The night light is broad-spectrum and contains all colours except the ones that primarily affect the body’s waking state during the night. This means that the staff has good visual conditions, while the body’s circadian rhythm and sleep quality are not affected. Vi ved, at patienter hurtigere kommer sig med døgnrytmelys. Vi tror på, at lyset har en stor effekt – også på personalet. Derfor har vi valgt at prioritere det. The lighting solution uses the latest technologies within LED. 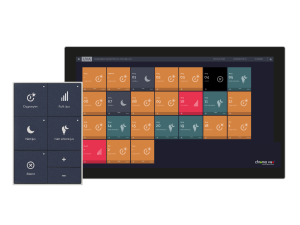 ”It is a complete solution, and the programming, lighting and flexibility are brand-new. In the operating rooms, the staff will have the right light precisely where they want it. 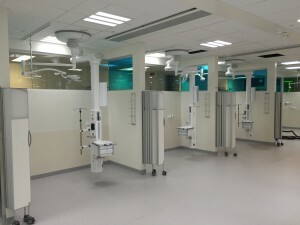 In intensive care, the patients and staff will have the possibility of controlling the light close to each bed”, explains Leif Fransson, project manager at MIDROC, the company responsible for the electrical work of the construction. Reliability has also been in focus. In addition to the many positive effects of the light and the new technologies, there has also been focus on ensuring a reliable solution. ”We have not had any problems with deliveries or initialisation. Therefore, I do not expect to have any problems with the lighting in the future”, says Leif Fransson. We have now created conditions ensuring that regardless of where you are working in the new building, you have access to optimal lighting. The staff group has great expectations for this, and Chromaviso’s next job is to train them. When the light was ready, all users were taught how to use the light. ”We have now created conditions ensuring that regardless of where you are working in the new building, you have access to optimal lighting. The staff group has great expectations for this, and Chromaviso’s next job is to train them”, says Tobias Kjellberg. Chromaviso regularly arranges training seances and technical follow-up – in order to ensure that the solution matches the requirements of the wards and the patients perfectly. 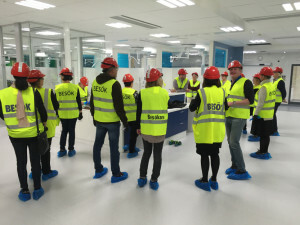 ”When you choose a health-promoting lighting solution such as ours, it is a vital task for us to ensure that all users are trained to operate the light and know the various options and advantages of the light. It is also during this phase that we can adjust the light to the needs of the department and the patient category. And finally, the dialogue with the customers contributes to our continued innovation”, explains Torben Skov Hansen.